A collection of short Kirby adventures. Bring back the food stolen by King Dedede in Spring Breeze, find the giant bird that's destroying all the crops in Dyna Blade, race against Dedede in Gourmet Race and hunt for lost treasure in The Great Cave Offensive. Two more adventures can also be unlocked. Bring down the Halberd in Revenge of the Meta Knight and travel the galaxy to stop the sun and moon from fighting in Milky Way Wishes. 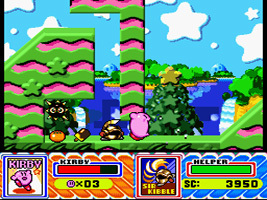 Kirby can transform his inhaled abilities into Helpers that can be controlled by the computer or a second player to help him take out enemies and solve puzzles. King Dedede has stolen all of the food in Dream Land. 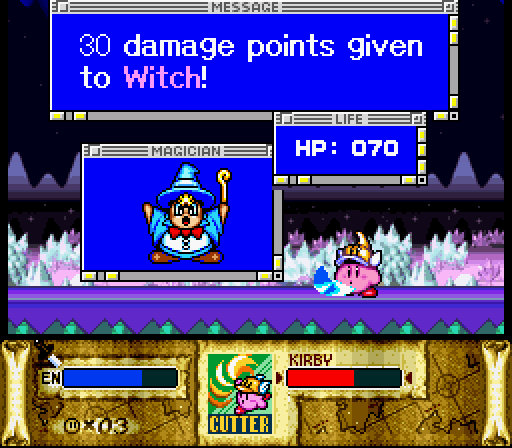 Kirby must fight his way to Mt. Dedede and get it back. A giant bird named Dyna Blade has been destroying Dream Land's crops and terrifying its inhabitants. Kirby sets off to put a stop to the bird's rampage. Kirby has discovered a land filled with delicious food. 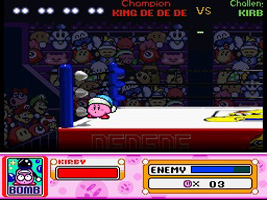 As soon as he arrives, however, he finds out that King Dedede has beaten him there. Now the two must race across the land, scoffing food, to see who will win the right to eat. While on a stroll, Kirby falls into a pit fall, landing in an underground world filled with treasure. Can he escape the labyrinth and collect all of the ancient treasures below? The dastardly Meta-Knight and his followers have constructed the terrible Halberd - a flying war machine that will help them to take control of Dream Land. 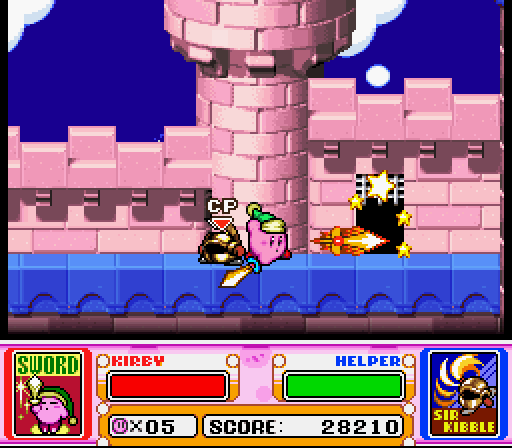 Kirby sets off on a mission to bring the Halberd down, and stop Meta-Knight's plans. The sun and the moon are fighting. A Dream Lander called Marx tells Kirby to travel across the solar system and speak to Nova, a wish-granting machine that can put a halt to the fighting for good. As well as the five main games, there are also two minigames to play. 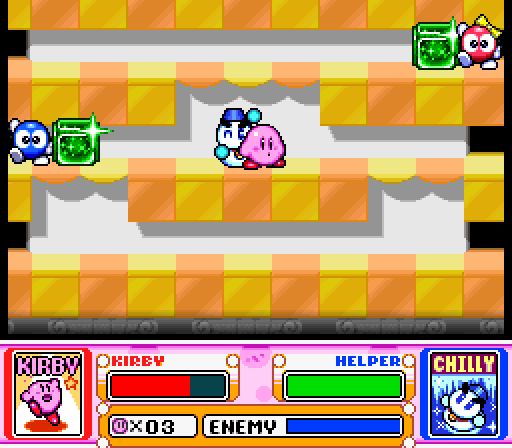 In Megaton Punch, you have to line up two power bars in order to give Kirby the strength to break blocks (and Pop Star). 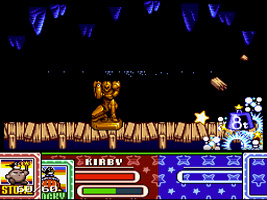 In Samurai Kirby, you have to test your reflexes against a range of enemies. During the Megaton Punch minigame and the Spring Breeze battle with King Dedede, you can see guests from the Mario series watching from the sidelines. Mario, Luigi, Toad and Birdo appear to cheer you on. The hero of the Mario series, striking his trademark victory pose. This gold statue appears extremely rarely. The heroine of the Metroid series, in a crouching pose. This gold statue appears extremely rarely. When Kirby gains the Sword ability he wears a green cap and a sword with a blue handle, referencing Link and the Master Sword from The Legend of Zelda series. Some of Kirby's sword attacks also seem to be modelled on Link's attacks from throughout the series. Several readers have suggested that Kirby's Yo-yo ability is modelled after Ness from EarthBound. 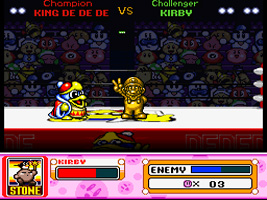 Yo-yo Kirby wears a baseball cap, the ability icon has a background similar to EarthBound's File Select screen, and both games were developed by HAL Laboratory. 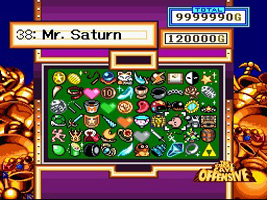 Many of the treasures are objects from Japanese folklore, and so have inspired items and objects from other games, such as Castlevania and Mystical Ninja. However, these are not game cameos. At the end of the Milky Way Wishes staff roll, Mario appears alongside the Nintendo logo. Meta Knight's ship is named the Halberd. While a Halberd is a type of weapon, it is also likely to be a reference to HAL Laboratory, the developers of the game. The bosses of Stage 2 of Spring Breeze, Lololo & Lalala, are based on the characters Lolo and Lala from HAL Laboratory's Adventures of Lolo series. 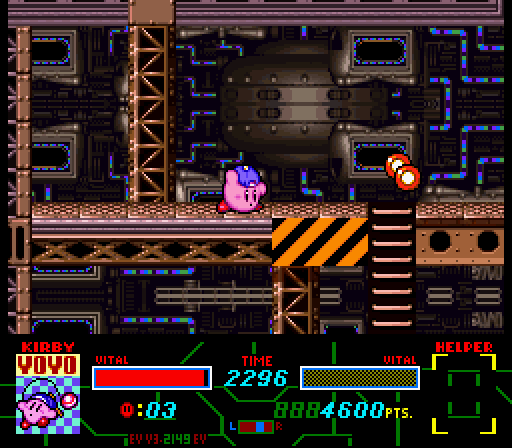 The Motor Shotzo enemy that appears in the Revenge of Meta Knight chapter is based on the player's vehicle in HAL Laboratory's Japan-only Game Boy game Charge! Ponkotsu Tank. One of the boss battles is based on classic RPGs, and appears to be played in windows that resemble those from the Mac OS 7. 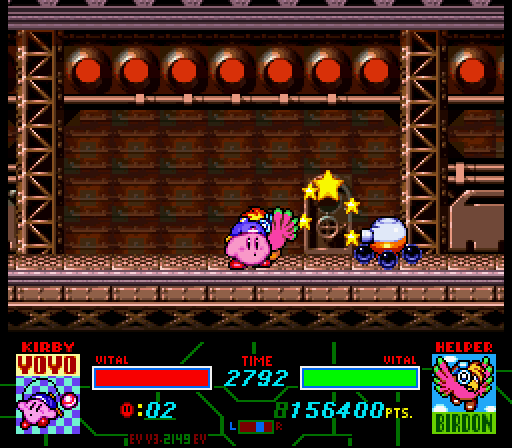 In Kirby Super Star Ultra, the boss reappears, but this time the windows have been upgraded to Mac OSX 10.2.